Be met our staff at the check point at Shichahai area. Get on the battery car at Shangwu Huiguan. Pass by the following attractions one by one and get off at any stop as you like. Qianhai Xijie Street, a famous Hutong district west of Qianhai Lake. 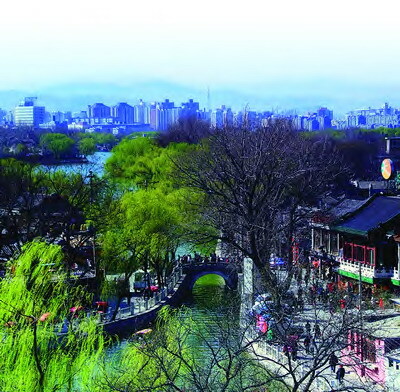 Shichahai Lake is evaluated as the most beautiful lake scenery in Beijing while the ancient Silver Ingot Bridge provides the best view for the lake. Then come to the Former Residence of Song Qingling, a legendary female in China of the past century. Song Qingling is the wife of Sun Yat-sen and the first and the only honorary president in PRC. Snacks at the Nine Gates Snacks will make your mouth water. Along the bank of lake, see the Wild Duck Island which is the paradise of the wild ducks and birds. Guahua Temple is a prominent Buddhist temple built sometime during Yuan Dynasty. Yandaixiejie Street, an ancient street where some valuable antiques and local Beijing folk gadgets might be bargain hunted. Kaorouji is a lakeside culinary landmark which has Muslim menu for you. Fire God Temple is another historical relic. Gold Ingot Bridge is the twin sister of Silver Ingot Bridge, facing with each other. The final stop is the Lotus Market. Notice: This tour does not include tour guide, if you would like to use a tour guide please let us know.